Covering a variety of topics that affect our everyday, our Sciences Department at North Mahaska gives students the opportunity to understand our contemporary world. Students will gain understanding in decision-making, independent thinking, and observation of their surroundings. Students can choose from biology, health issues, chemistry, physical science, physics and environmental science as they seek to interact with the cause and effect found in their environment. Born and raised in a small town Kansas community, Kipp Schuler discovered a passion for running which led him to a college career in track and cross country. While attending, Kipp discovered a liking for the sciences and people. As a result, he chose to pursue Secondary Education in the physical sciences. 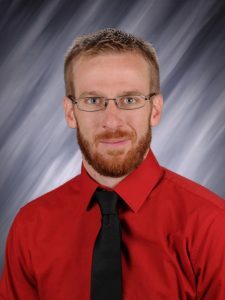 After graduating from William Penn University he started his teaching and coaching career in 2012 here at North Mahaska.